Spice Up Your Wedding Menu!! Wedding decor and wedding food are probably the most important elements of wedding planning.Both of these have to complement each other. While most wedding decorators and caterers have pre-set packages to choose from, we don't think it is a great way to choose the decor and the Wedding Menu for your big day! First step is to choose your theme and color palette. And next, start moving on and planning your decor and food; which fits with your chosen theme and color palette. While the other things are pretty much taken care of, one thing we have noticed as wedding planners is that the buffet decor is something most people overlook. This is very important. You may serve great food but, the presentation is equally important! Here are some tips which may be useful while planning your buffet setup. The basic setup at any buffet will remain the same, but adding attractive elements will enhance the look. 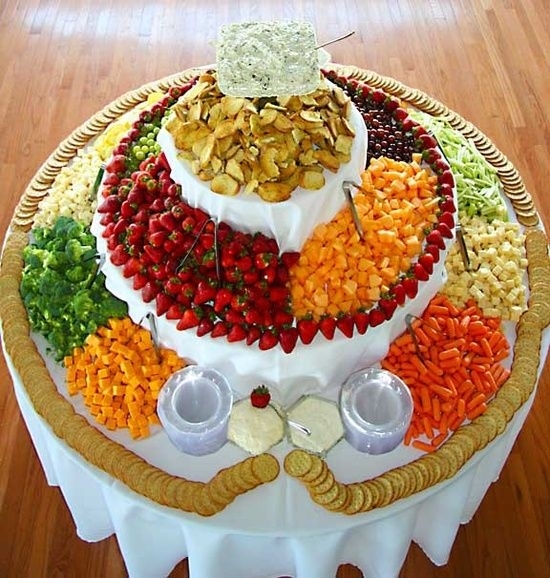 Instead of serving food in traditional chafing dishes, you could opt for platters of various shapes placed on different levels to create layers. This sets a whole different mood. According to your theme you can choose whether you want to go with ceramic or glassware. Fruits and vegetables can be used along with flowers and some decorative elements to make attractive center pieces instead of just flowers. For a more rustic feel, preserves can be directly served from jars, which are usually used for storing. Also instead of placing all food in platters or serving dishes, you could have bite sized portions of food served in small individual dishes or small shot glasses depending on the nature of food being served. Adding candles to your wedding decor will give it a more relaxed look, but we would not recommend it. Safety becomes a big issue with kids around and don't forget, sometimes the fragrance of the candle may overpower the food.Another thing you can play with is lighting though we would suggest very subtle mood lighting. For special counters like cheese you can display a variety of exotic cheeses along with nuts, crackers, wine and grapes as these go perfectly with cheese. You could also have a special area for wine connoisseurs to enjoy cheese and wine a wine bar maybe? And of course, the always popular live stations these will make your buffet interactive and fun. This way food can be customized for your guests. We hope these tips come in handy for you to spice up your buffet decor. Let us know your tips and ideas. Post Your Comment for Spice Up Your Wedding Menu! !